The message from team manager Carl Johnson to hit the ground running presumably got through loud and clear to the Peterborough Panthers riders. And just as audible will be the statement of intent the city racers sent echoing around the Premier League last night (April 1) when putting Scunthorpe to the sword in a League Cup Midland Group massacre. Panthers powered to a 64-26 triumph at the East of England Showground – their largest victory since returning to the second tier of the sport in 2014 and one which confirmed the immense potential of a septet carefully assembled by club bosses during the winter. But for a mechanical failure, an exclusion and a small tumble, they may well have threatened the club record 70-20 drubbing of Coventry in an Elite League fixture back in 2013. Although they didn’t quite equal that feat in the end, Panthers looked in a different league to a set of visitors who arrived boasting an away win already this season. Scunthorpe were victorious at Ipswich a couple of weeks ago. Last night they only managed to win one race and claim one heat advantage. Panthers chief Johnson said: “We really stressed to the guys the importance of getting straight into the groove this week. “We knew we were going into the trip to Sheffield on Thursday cold, but we managed to get a very good draw up there. “It was important to follow it up with a win at home, and we really showed everyone what we’re capable of doing. “Perhaps Scunthorpe aren’t the strongest team we’ll face, but we could only beat what was in front of us and we did it convincingly. The only blot on Panthers’ copybook last night arrived in a re-run of heat 10 when Scunthorpe man Ryan Douglas got the better of captain Ulrich Ostergaard with young reserve Josh Bailey back in third. Otherwise there were three shared races – two of them arriving back-to-back early on and the other in the finale – and 11 which ended in Panthers gains. Of that tally, nine resulted in 5-1s including the first two races and a run of five heats in a row during the mid-part of the meeting. 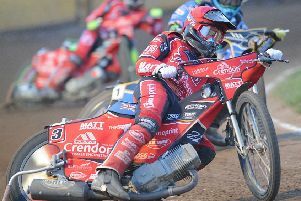 Admittedly Scunthorpe were without one rider – Nicolai Klindt - due to an Elite League fixture clash and lost another – Zdenek Holub – with a suspected shoulder injury after a nasty third heat tangle with Michael Palm Toft. But it is difficult to think either of those men playing a full part would have made much difference to an emphatic scoreline. Panthers were simply too strong from start to finish. Skipper Ostergaard was the highest-scoring home rider with a 13+1 haul while Nikolaj Busk Jakobsen and Emil Grondal also finished in double-figures. Busk Jakobsen only saw his hopes of a paid maximum disappear in his final ride and the same applied to fellow home debutant Tom Perry. But the British reserve already looks set to be one of the finest homegrown riders at number seven in the league with a dozen points across the last couple of nights. Perry was there to pick up the pieces when Nicklas Porsing ground to a halt while leading heat four and also added two more paid wins to his collection before being eclipsed by Scorpions captain Carl Wilkinson for second spot in heat 14. All seven Panthers riders won at least one race as the hosts demonstrated their strength in depth with paid nine being the lowest score produced by home riders - Lambert, Porsing and Palm Toft all ended up with that. Panthers are back in action next Friday (April 8) when hosting Sheffield at the Showground ahead of a Sunday (April 10) visit to Scunthorpe. Those three teams are locked together on five points in the chase for Midland Group top-spot and a place in the semi-finals of the League Cup. PETERBOROUGH ‘T BALFE CONSTRUCTION’ PANTHERS: Ulrich Ostergaard 13+1, Nikolaj Busk Jakobsen 11+1, Emil Grondal 10, Tom Perry 8+2, Simon Lambert 8+1, Nicklas Porsing 7+2, Michael Palm Toft 7+2. SCUNTHORPE: Ryan Douglas 8+1, Josh Auty 7, Alex Davies 4, Josh Bailey 3+2, Carl Wilkinson 3, Richard Hall (guest) 1, Zdenek Holub (withdrawn) 0.